Jakarta, July 18th 2014 – To answer to Bandung’s need for quality budget accommodations and increasing demand for its popular select service favehotel group, Archipelago International on July 15th, 2014 opened the favehotel Hyper Square – Bandung, which is the groups third hotel under the fave label in Bandung and the 6th Archipelago International managed property in the city. 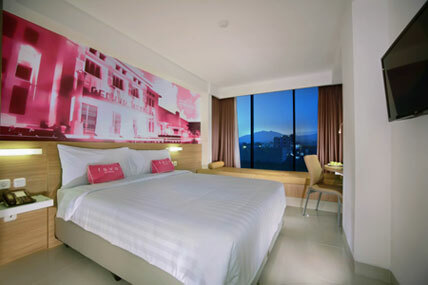 Bandung is the capital city of West Java and the third largest city in Indonesia. It was nicknamed Parijs van Java (Paris of Java) by the Dutch, thanks to its charming resemblance to Paris and Europe during colonial times. It is also named Kota Kembang, which literally means the “Flower City”, since it became famous for its abundance of fresh flowers and foliage. The city offers a number of leisure activities for visitors to enjoy, both within the city and throughout the surrounding mountain and highland areas. Activities in the outskirts of the city are centered around the mountain resorts, adventure activities and outdoor sports, whist in the city, visitors are treated to a wealth of dining options, clothing outlets and beautiful spots to just hang around and enjoy. The favehotel Hyper Square is situated in one of Bandung’s most practical locations on the easily accessible Jalan Pasir Kaliki, just 15 minutes from Husein Sastranegara International Airport. 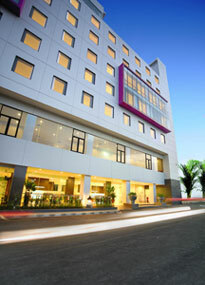 The hotel is also just 10 minutes from the Pasteur toll gate and 5 minutes from Bandung’s main Rail Station. The 161 stylish rooms will be modern, functional and super clean, decked out with cutting-edge LED TVs, fast and reliable complimentary WiFi throughout the entire hotel, security key card systems, air conditioning, in room safes and top of the line beds with high knot count cotton linens. Outside of the rooms, guests can indulge at the signature Lime Restaurant with its fabulous menu choices, or for a different atmosphere, the patio and terrace area provides the perfect spot for stylish, outdoor dining. For business travel needs, the hotel offers 6 fully equipped meeting rooms. The meeting rooms range in size from the smaller rooms suitable for more intimate meetings, right up to the large banquet-sized function rooms for grander events. The hotel also features its own ballroom, available for use for both business and leisure affairs. "favehotel Hyper Square aims to become the area’s best in class select service hotel, as it affords a number of facilities and amenities usually found in more up market hotels. The opening of this property reflects a continuation of our business strategy, which is to offer business travelers high-quality, affordable accommodation alternatives in Indonesia's most prominent cities." Said John Flood, Archipelago International's President & CEO. favehotels currently operates 28 hotels throughout Indonesia and Malaysia out of which 10 are in Jakarta and 4 in Bali and has a development pipeline of more than 40 hotels in Indonesia, Malaysia and the Philippines.